American Archives Month began in 2006 and is an opportunity for archivists to promote their collections and the profession. This month you have many opportunities to engage with your Special Collections & University Archives staff and collections! #AskAnArchivistDay! Tomorrow, October 4th, archivists around the country will take to Twitter to respond to questions tweeted with the hashtag #AskAnArchivist. Tweet your questions to @ISU_Archives and include #AskAnArchivist. The Bomb Transcribe-a-thon on October 25, 12-4 PM, 134 Parks Library. Hosted by Digital Initiatives, and featuring Brad Kuennen, University Archivist, who will talk about the history of the The Bomb. Homecoming Pop-up Exhibition on October 27, 1-4 PM, 405 Parks Library. Check out our unique items on Iowa State history & student life in the 1960s. Halloween Exhibition & Trivia on October 31, 11 AM – 2 PM, 405 Parks Library. Check out what chilling & thrilling items we’ll have on display, answer some trivia questions, and win some prizes. Stop by and visit us on the 4th floor of the Parks Library (403 Parks) and check out our current exhibition “This movement for a more beautiful Iowa”: The Early Years of Iowa’s State Park System. If you’re working in an archives or cultural heritage institution and would like ideas on how to celebrate visit: https://www2.archivists.org/initiatives/american-archives-month-the-power-of-collaboration. CyPix: Did you say archives? October is American Archives Month, when archivists around the country spread the word about how exciting, informative, even life-changing archives can be. The two images today are from past events when the Special Collections Department invited people to get a deeper view of what archives are all about. 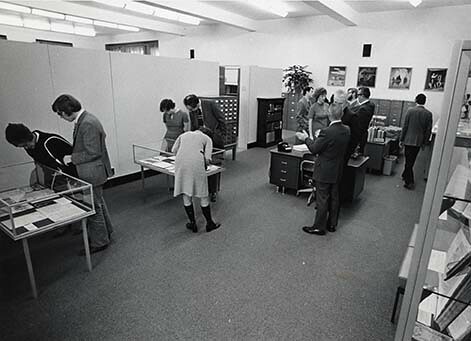 This first image shows the Special Collections Open House from 1971, only two years after the department opened. Visitors are viewing archival documents in display cases. Special Collections Open House, October 31, 1971. University Archives Photograph Collection Box 2053. The second photo is a little more recent, the History Day event from 2001, where students came from area schools to get the behind-the-scenes tour of what goes on in Special Collections and learn how to do archival research. Students examining documents from archival collections during the Special Collections History Day, February 22, 2001. University Archives Photograph Collection Box 2047. Wondering how to do archival research yourself? Please check out the new Archives Overview LibGuide created by our department’s Digital Archivist, Kim Anderson! It answers questions like, What are archives? How do I find archival collections? and, How do I care for my own archives? As always, we would love to see you in our department. Stop by and see us! Every October is American Archives Month – a time to celebrate the work of archivists and the physical and digital items that benefit from our care. There are as many ways to celebrate Archives Month (or #archivesmonth, on Twitter) as there are archival repositories. Larger archival institutions have a full range of activities to showcase their work. The National Archives and Records Administration profiles staff members and favorite items throughout the month on social media. Smithsonian Institute Archives covers its work through a number of virtual and in-person opportunities. Here at ISU Special Collections, we celebrate by working: accepting university records and donated materials relating to our collecting areas; working with donors; processing materials; answering questions from the wide variety of folks who enlist our help; educating students through tours and classroom talks; and providing access to our collections through our website and Reading Room. The Society of American Archivists, our professional organization, is observing Archives Month, of course. The association president, Kathleen Roe, recently wrote a blog post and asked the question “Who have you met on your journey through archival records?” She posed her question in reference to people whom she met through the historical record – such as the faculty and staff, students, and alumni whose collections we hold. Students of all ages, from middle school on up to retirees who are curious about something and have the time to pop in. And of course academic scholars from ISU as well as other institutions who seek the rare and unique information that we hold. Even the questions that they ask, about the archives or about their interests, teach me lessons about my work all the time! Our student workers, who bring their perspectives and questions to work every week. It’s nice to hear what student life is like in 2014 when I’m used to fielding questions and handling materials that are often older than today’s students. Donors who generously hand their memories, or their loved ones’ memories, over for care-taking. It is a privilege to assess a lifetime’s worth of accumulated materials and process them to allow others to benefit from all the knowledge within. Colleagues who have fielded my questions, encouraged and mentored me, introduced me to other archives colleagues in their network, and so on and so forth through the six degrees of separation between me and Kevin Bacon. No, wait, between me and famed archivist Theodore Roosevelt Schellenberg. Archivists of the wider world who I meet through graduate school, or at regional conferences, or at the SAA Annual Meeting – which was held with two other records-centric organizations this year. There is an unending supply of new people to meet, share stories with, and learn from. Much appreciation goes out to all those who make our work as archivists possible – especially the archivists ourselves. You can celebrate American Archives Month by coming by to see our new exhibit on Homecoming, doing research, or checking out all the resources we have available through our [newly updated] website! For American Archives Month: What is the Special Collections Department and University Archives? A portion of the University Photograph Collection in the University Archives can be seen above. The fall semester has definitely arrived and is now in full swing, with students and researchers coming in to the Special Collections Department daily to work on research papers or locate that hard-to-find fact related to Iowa State University and its over one hundred and fifty years of history. In addition to being a busy month for students with midterm exams and projects nearing their deadlines, October is American Archives Month. Archives Month gives archivists across the country an opportunity to promote awareness of archives, what they do, and the collections they hold. For American Archives Month: An Online Tour of Special Collections! American Archives Month: Fun Tools For Discovering What Archives Are About! Anyone is welcome to visit the Special Collections Department. Please feel free to stop by at any time Monday through Friday, 9 a.m. to 4 p.m. In addition to our collection of rare books and historical records, we also have a new display in our Reading Room: “Make Our Spirits Great: 100 Years of Homecoming History.” If you are not able to visit our reading room, we also have an online exhibit available. First Homecoming game in 1912 against the University of Iowa.